Welcome to another WIP Wednesday! This week’s update will be slightly abridged, as we’ve had a bit of a busy week around here, but we couldn’t go without sharing a few amazing projects with you all! First off, Oleya has proudly completed her Carnaby skirt in Brooklyn Tweed SHELTER in Sweatshirt! The yarn has such great structure to it; the skirt looks so well-tailored and doesn’t sag. Oleya says the skirt is extremely light and comfortable. Plus, how cute does she look in it?! Eva, after spending her vacation knitting with a vengeance, has two projects to share today. The first is Beth Hahn’s Paper Moon cloche, with a modified cabled/i-cord border that Eva designed herself. She’s making it with The Sanguine Gryphon Codex in Molly Bloom, which has great stitch definition for crisp cables. 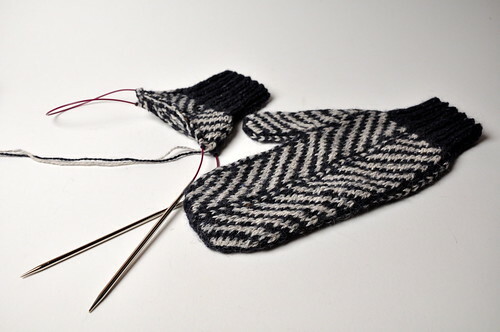 Finally, Eva’s second project is Jared Flood’s Strago mittens. She’s well into the second of the pair, and is loving the pattern (as always when it comes to Jared). The yarn is one of Eva’s all-time favorites: Rowan Felted Tweed, in Clay and Seafarer. That’s all for today, but we hope we’ve provided a bit of inspiration for all of your projects! ‘Til next week, happy knitting! 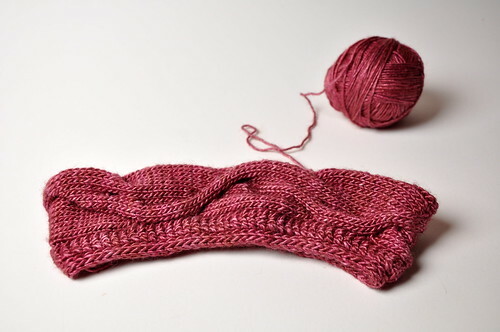 The post A Wee WIP Wednesday appeared first on Knit Purl Blog.